Moderator Warren Olney, host of KCRW’s “To the Point,” put that query to a panel of three experts—Julia Davis, a Ukraine-born film producer and founder of the Russian Media Monitor, which analyzes Russian state media in the broader context of the Kremlin’s propaganda; Asha Rangappa, a former FBI agent and now Senior Lecturer at Yale University’s Jackson Institute for Global Affairs; and Caroline Orr, a Virginia Commonwealth University behavioral scientist who uses open-source information and data analytics to examine how Russia has weaponized social media against the United States. The short answer, given by all three: “Yes,” America can prevail. 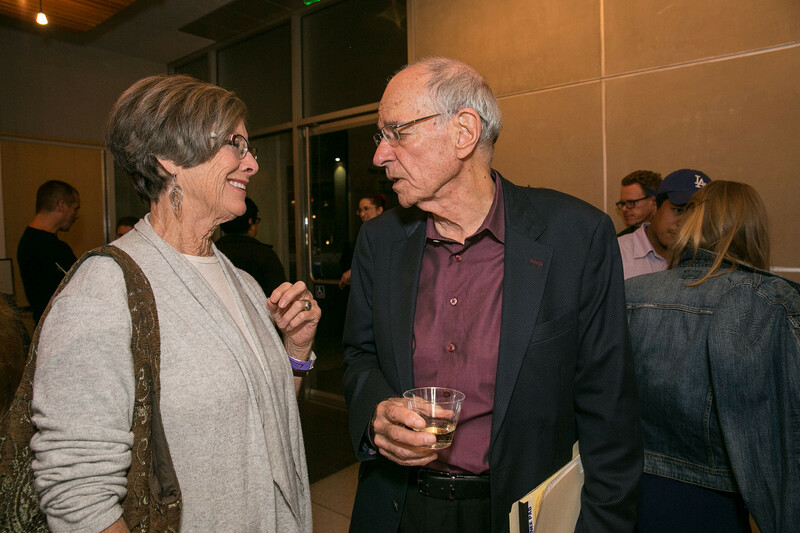 But as the panelists told an overflow crowd at the National Center for the Preservation of Democracy in downtown Los Angeles, the United States is engaged in a new form of combat with Russia that won’t end anytime soon—no matter which political party controls Congress or the White House. Russia’s goal isn’t simply to boost a particular politician, or hand a megaphone to an extremist fringe group, but to undermine America’s core democratic values, institutions, and way of life, the panelists concurred. “The more chaos there is here, the more it benefits Putin’s agenda,” Davis summarized. For example, she continued, even though evidence is mounting that Russia intervened in 2016 to help elect Donald Trump, the Russians wouldn’t be worried if Trump were to be impeached. Instead, Davis said, they’d be trying to exploit the situation to provoke massive civil discord, even armed unrest. Orr said that Russian intelligence operatives have a variety of strategies and objectives for making Americans lunge at each other’s throats, even over something as relatively innocuous as whether NFL players should stand during the national anthem. In that situation, Orr said, the Russians are tapping into a preexisting societal problem of racism, and simply amplifying it digitally. “Sometimes [the Russian strategy] is to distract us, sometimes to make us fight, sometimes to make us hopeless,” Orr said. Olney asked: Why hasn’t the United States been able to fight back more effectively against these threats. Rangappa said Americans have sufficient intelligence capacity for this contest, but also “have one big law that stands in the way of the government doing anything, and that is the First Amendment.” Rangappa, an adamant proponent of free speech, acknowledged that America’s constitutional protections are sometimes at odds with the ability to clamp down on foreign propaganda machines. “The FBI and the First Amendment are two great tastes that do not go great together,” she said. And sophisticated digital technology has abetted perpetrators’ ability not only to carry out cyberattacks but also to hide behind a wall of anonymity. 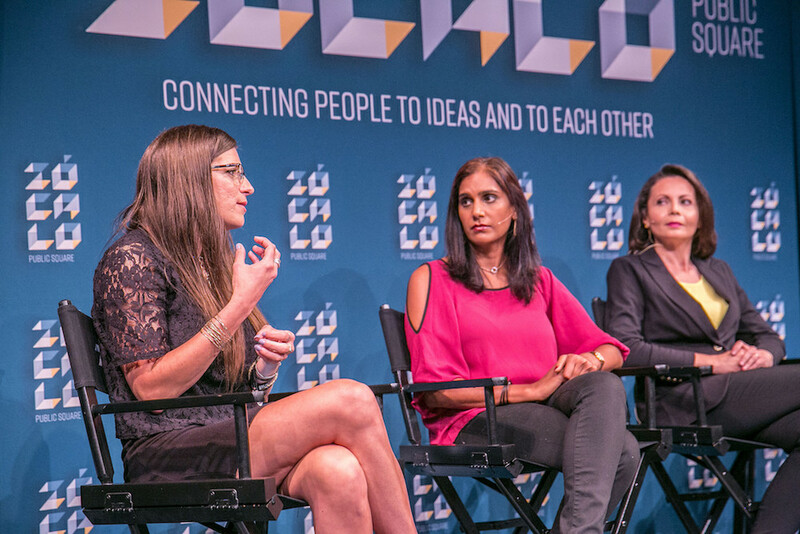 A key difference between our present age and the Cold War era, Rangappa said, is that today’s technology platforms can put out information much faster, with a much wider reach, and in ways that the United States can counter only in limited ways. One way, she said, is to force Russia propaganda outlets masquerading as journalistic enterprises to register as foreign agents, as RT (formerly Russia Today) and Sputnik recently were required to do. Moving to specifics, Olney asked the panelists who exactly the Russians are targeting. Davis replied that, since around 2009, the Russians have been identifying people who are feeling disenfranchised, who don’t believe their votes or their voices count, and who are cynical about the state of the U.S. Russia wants to discourage such people from voting and to make them believe that democracy itself is a sham, as it is in Russia. Asked by Olney why people are vulnerable to this type of misleading information, Orr explained that, for one thing, these messages are narrowly targeted to various segments of the population, for maximum impact. “We’re all susceptible to believing things that sound good, things that play into beliefs that we already have,” Orr said. “They help us make sense out of things that don’t necessarily make sense,” supply satisfying answers to troubling questions, and soothe us by their sheer simplicity. But how, Olney persisted, is it possible to build a small platform on Facebook or Twitter into a gigantic, continent-spanning echo chamber of like-minded people? Orr replied that the Russians launch many trial runs to see what kinds of storylines will get shared repeatedly online. One Russian campaign targeting U.S. veterans has been notably successful because it taps into issues that veterans already care about, she said. Russian trolls and bots also tend to push out controversial material during the wee morning hours in the United States. Few Americans are using social media between, say, 2 and 4 a.m. But when the East Coast starts waking up a couple hours later, it will be greeted by an inflammatory new hashtag generated in Moscow. More Americans will start wading into the conversation, at which point the Russian perpetrators can quietly melt back, undetected, into the angry online mob they’ve aroused. “It looks completely organic, it looks human-driven,” Orr said of these bot-orchestrated online conflicts. And it’s not easy to persuade people who’ve fallen for such propaganda that they’ve been duped. “Simply telling somebody… that what they think is incorrect is not an effective way of changing people’s minds,” Orr said. “Part of the reason is, we’re susceptible to believing misinformation because we want to. We don’t want to believe that we’ve been fooled.” What’s more, she said, a lot of Russian propaganda isn’t aimed at convincing you of a particular viewpoint; its more insidious purpose is to convince you that no truth exists. The goal is to make people feel mentally overwhelmed and worn out, so they’ll stop trying to figure out which version of, say, the Syrian civil war to believe, and will give in to cynicism and despair, Orr suggested. As the conversational mood tone grew darker than a chapter of John le Carré, Olney was moved to observe that, “This is a very disturbing situation!” eliciting uneasy laughter from the audience. Indeed, the panelists emphasized, the American public needs to awaken to the size and scope of the threat—fast. The Russians are weaponizing our most fundamental freedoms, and launching them at our own society and institutions. There are ways to fight back. 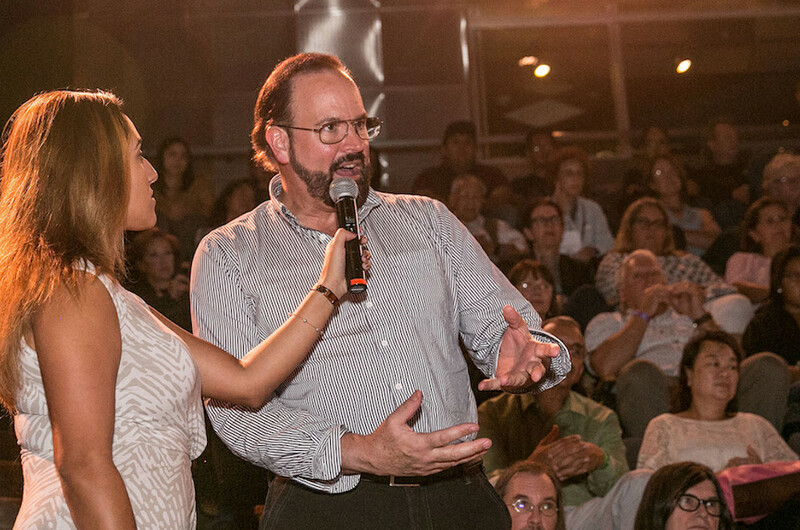 Responding to a question from the audience, the panelists mentioned Twitter accounts and websites such as Hamilton 68 that monitor Russian propaganda. 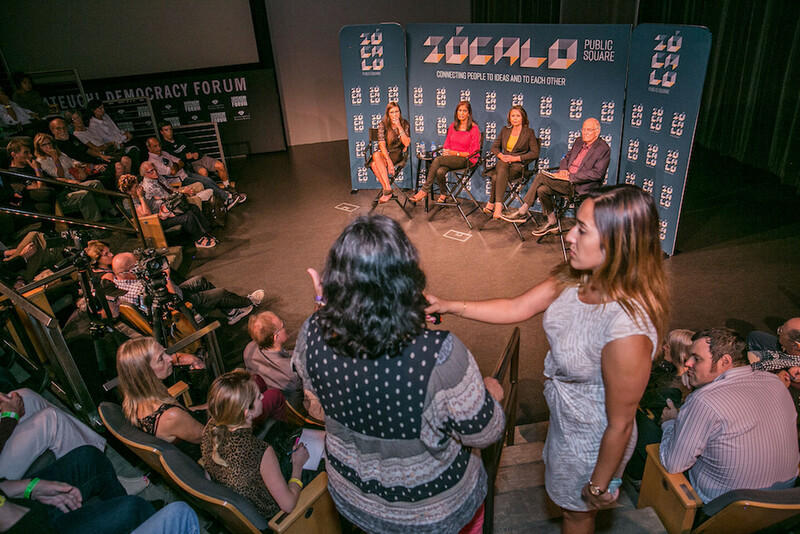 Educational programs are available to teach young people how to distinguish fact-based journalism from conspiratorial fantasies, the panelists said. Congress also must play a role in hitting back at Putin and his oligarchical allies with tough economic sanctions, the women agreed. “We are in serious peril and we shouldn’t be enriching Putin and his cronies in the process,” Davis said. 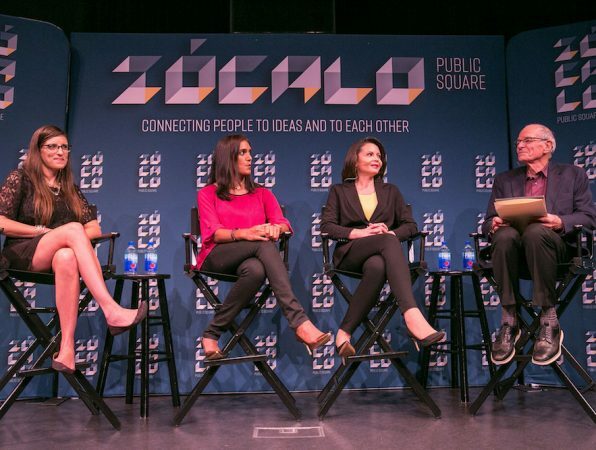 The panelists said that, while the U.S. government can take measures and Silicon Valley needs to be held more accountable for granting wide bandwidth to hostile foreign powers, in the end it’s up to us as individual citizens to pay attention to our information sources, protect ourselves, and defend democracy. 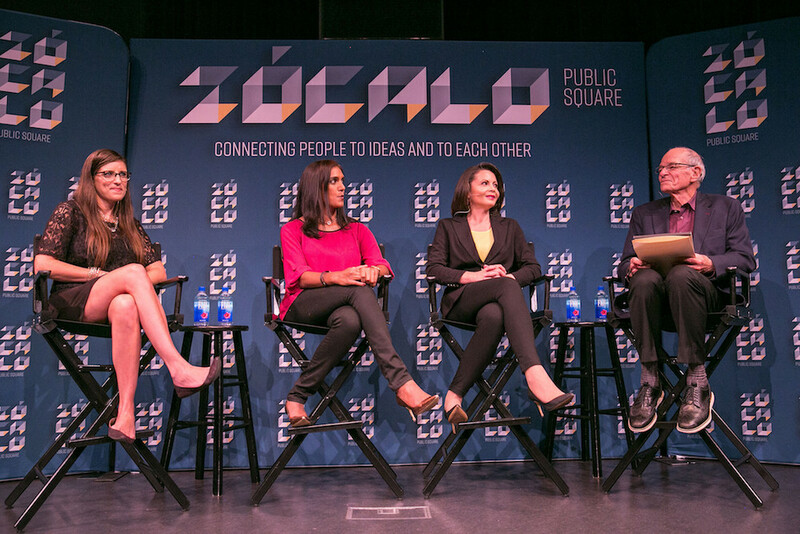 Caroline Orr, Asha Rangappa, and Julia Davis at Zócalo Public Square. 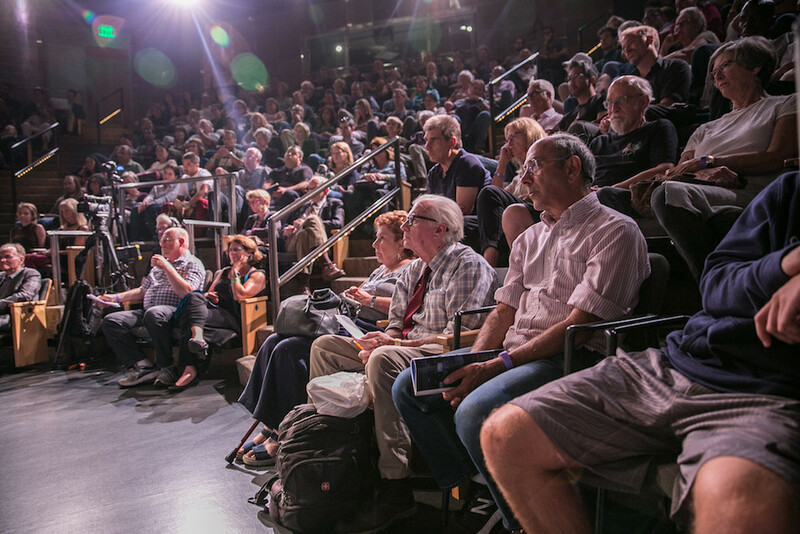 An overflow crowd at the National Center for the Preservation of Democracy in Los Angeles. 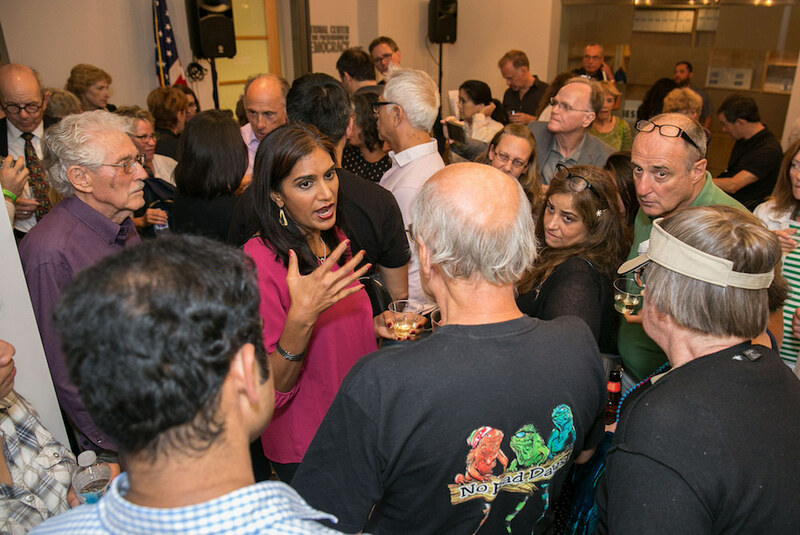 Yale University's Asha Rangappa speaks with guests at the reception.